These Spinach and Butter Bean Baked eggs are a great way to make the most of the Spinach and eggs in this week's share! You can customise them however you like - they make the perfect easy breakfast or brunch with some crusty bread. 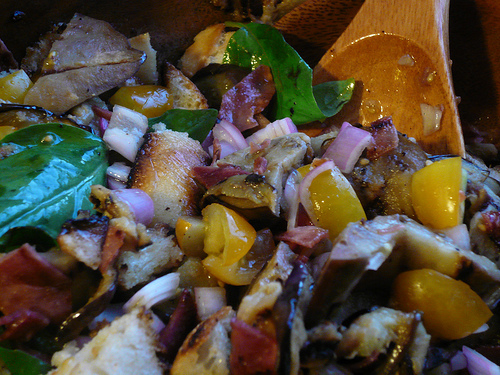 The Recipe comes from CSA member Erin Clarkson who blogs at Cloudy Kitchen. You can find the recipe on her Blog. Happy Brunching! I used three apples to make this very simple, super moist one bowl cake. Serve it with ice cream and it's dessert. Eat it off a napkin in the morning and it's breakfast. Butter a round springform pan. Arrange the apple slices on the bottom of your pan. You will invert the cake when it comes out of the oven and this will be the "top." If you prefer not to do it like that or don't have a springform pan, save the slices and put them on the top of the batter once it's already in the pan. Cream the butter and sugar. Add eggs one at a time, then add flour and baking powder. Once mixed a little, stir in the vanilla, cinnamon, allspice, nutmeg and chopped apple pieces. Pour the batter over the sliced apples pre-arranged in the bottom of the pan. Bake for 45 min at 325 degrees in an 8" springform /metal pan or 35 minutes at 350 degrees in a glass baking dish. Invert onto a dish.